Wafting up through the companionway comes the smell of home fries cooking for breakfast. In my hand is a cup of hot coffee and I’m listening to the waves and watching a pod of dolphins swim through the anchorage. A gentle wind ripples the reflection of the warm sun, and the salt from my morning swim is drying on my skin. It’s one of those yes kind of mornings, a sensory overload, a pinch me moment. As breakfast cooks I find myself thinking about the conversations we’ve had lately while meeting new friends and swapping stories with old friends at potlucks and sundowners. The other night we were invited over to a boat buddie’s 50’ catamaran moored in the marina where a group of 20 or so was comfortably spread around the huge aft deck enjoying some great food and conversation. Some of the folks we met were land based, living in condos overlooking the sailing fleet at anchor. It’s always fun to hear their perspective on what life at sea must be like, and to be able to chuckle at the confession that one woman brought some Dramamine along, just in case she might get seasick… At the dock… On a gigantic cat. Well, I guess it could happen! 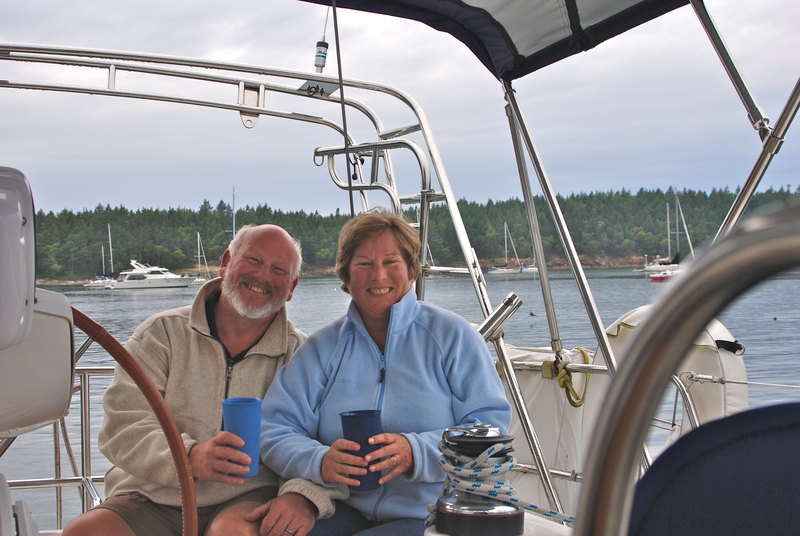 As introductions were made Marty and I were asked about our life BS…before sailing. We both had our corporate jobs, but our last gig was the B&B. So we shared a few of the fun and funny stories of running the Inn. Count ‘em twice! When serving lots of folks at one time, we always counted out a stack of plates for the number of guests we were serving so that we could serve them all at once. Well as you can guess, on a morning when we had 20 guests, we counted wrong and only put out 19 plates! I took the final meals out to the dining room and when I looked at the table I noticed that we were missing a meal for one guest….RUTRO! That morning I had made Aunt Penny’s eggs, a sumptuous take on scrambled eggs. I quickly went to the fridge thinking I could just whip up a couple more eggs and no one would be the wiser, but alas, there were no eggs left! I ran over to Mom’s house next store, and you guessed it, she didn’t have any eggs either! Time was running out, so I had to come clean to our guest and tell her I couldn’t count and would she like something else for breakfast. Thankfully she laughed and said that was fine with her, she didn’t like eggs anyway! The moral to this story – count the plates twice! One Sunday soon after we’d opened, we had a group of four ladies checking out while Mom was behind the bar serving Mimosas for Sunday brunch. All teachers, this fun foursome got together once a year for a weekend outing. On this particular year they had come to our Inn to enjoy the island and to go see the tulip festival. Well, they had arrived just in time to see that all the tulips had already been “whacked” for bulbs so all there was to see was a field of green stems. In telling us this story we were all laughing hysterically, and somehow it came out that they’d held a lemon drop party to drown their sorrows at not seeing the tulips! Well, neither Mom or I knew what a lemon drop was, so out came their satchel that served as a traveling bar, and pretty soon Mom and I were drinking lemon drop martinis at 9 in the morning and hearing more great stories of the ladies’ travels. These four ladies became very dear to us and came back year after year (and they finally saw the tulips), and they were known to us as the lemon drop ladies! Just one example of how we met many lasting friends during our stint as Innkeepers. There are many, many, MANY tales of getting three 1880’s houses ready for show! My Mom and I started the project when I purchased my first Victorian house so that I could move from Texas back home to the NW. She and I traveled to Coupeville to move in and start the remodel a few days before Christmas. We arrived at night to a cold house, with no oil for the heater, no electricity, no propane for the stove, and worst of all, no wine opener for the wine… an ominous beginning! In a few days we had the quirks ironed out, and our air mattresses laid out in the house and the tiny cottage out back where I intended to live. Reinforcements soon arrived when my sister and brother-in-law, my son, and my aunt all showed up for Christmas and a demolition project! Nothing says Christmas like a massive project with crowbars and hammers, hedge trimmers and hatchets! The first order of business was to remove years of growth of the wisteria tree that was covering the cottage. We cut down two huge truckloads of old growth and discovered that the cottage had a false front that we didn’t know was there! What a start! Mom on a ladder..get down! There’s a house under there! We painted and polished, plumbed and wall papered our little hearts out for three months. My Mom, who was 80 at the time, led the charge with hammer in hand, or while standing on the top of a ladder pulling off eons of old wallpaper. My cousins and my brother showed up to help with the project, painting 13’ ceilings and rebuilding porches. It was a labor of love and I can never thank my family enough for all they did to help. One day I was stirring a 5-gallon bucket of oil-based paint that would be used to cover the old wallpaper and help it re-stick to the walls where it was peeling in places. Since the walls were lath and plaster, removing the wallpaper was a nightmare so we were able to paint over it with the oil based paint, but if you’ve ever tried to stir a 5-gallon can of thick gooey oil paint you know it’s hard to do! I had the bright idea of turning the bucket on its side and rolling it to mix it. You can probably guess what’s coming… I turned the bucket on its side and started rolling it back and forth when whoosh, off popped the lid and 5 gallons of white paint started pouring across our original 1887 pine plank floors… ARRRGH! It was a moment of utter horror followed by frantic action as we all ran to the kitchen to grab whatever we could to scoop up the paint. With spatulas and spoons flying we soon had the paint corralled and the floor was saved. Then there is the story of the raccoons under the house, or the water heater that flooded, or the time I fell through the ceiling, or opening night and the county health inspector… yes, the stories are endless and someday I really will write that book, but for now I need to explain the title of this blog! While regaling everyone with stories of human nature meets Bed and Breakfast, Marty and I found ourselves mentally reminiscing about all the good times we’d had running the Inn together. It was an awesome time, albeit with tons of work! We had three lovely years with my Mom in residence, we met many friends along the way, and we have a bazillion fond memories of Whidbey Island. So yes, that was very, very nice. But as you can probably guess… this is better! Our cruising lifestyle is a dream come true, full of freedom, friendship, escapades and exhilaration. Marty and I are so incredibly lucky to have found each other (thanks e-harmony) and to be able to live our dream. It’s a rare gift to be able to survive with someone in a 43’ x 13’ space 24/7/365 and still laugh at their jokes! Seriously though, it is bliss to have found someone who enjoys the same views, is ready for the same adventures, and who is able to laugh at the inconveniences. Living on a sailboat is amazing, but it’s also a bit of a challenge. Cooking and storing food can be an ordeal when faced with trying to store a month of food in a tiny space, or trying to cook up a meal on two burners while the boat rocks on the waves. Fresh food goes bad fast in the heat. Shopping means a trip to town via the dinghy followed by a hot walk and a bus ride, with heavy backpacks on the trip back to the boat, usually after the wind and waves pick up. It’s quite a difference from my old kitchen with its double ovens, two full size fridges and a separate freezer, and weekly deliveries from Costco! Projects on a boat require coordination. Everything has to stop while one section of the boat gets dismantled to either find something for the project or to open up the area needing the attention. We have to take turns being “go-fer” on project days so that whoever is in charge has what they need once stuck down in a hold doing boat yoga and needing another tool. And there is never a simple project on a boat; everything takes longer and is more difficult than expected, so you might as well just give in to it. Marty does miss his “man cave” occasionally where he had every tool available and plenty of room to make noise. Thankfully though, we have all the comforts we need in our floating “mansion” and we enjoy all the oddities that cruising brings. The discomforts are far exceeded by the contentment found in having the time to enjoy the adventure. If I was to describe my overall favorite part of our lifestyle I guess it would be the little details. In having time and freedom to go where we want when we want, we are able to see and experience the little stuff. We can be entertained by the boobies diving for fish, we can float in the water and listen to the whales sing, we can play chess and read books without feeling guilty that the lawn isn’t getting mowed, we can quietly share the sunrises and sunsets, we can pull anchor and roll out the sails when the wind comes up, we can call up a friend and share a sundowner. Everything and anything is available and we have the time and the freedom to enjoy it all. We move slower and see more, we talk less and say more; we have less stuff and live more. So as I look out at another day of sunshine and water, I thank our lucky stars that we made the leap and risked it all. I love this friggin’ life! Marty smashed the eggs…oh well! We are in Bucerias, so if you around let’s meet for lunch!